The alleged “Greekness” of the Terracotta Army went viral, but archaeologists in China (and around the world) were skeptical and dismissive. Archaeological discoveries in China rarely get noticed. Recently, though, mitochondrial DNA tests conducted on human remains from Xinjiang, China’s westernmost province, got the attention of international media. The results suggested the presence of “Westerners” in China as early as the third century B.C., during the lifetime of Qin Shui Hang (259-210 B.C. ), the first emperor of China. It happened just as new and startling claims were being made about Emperor Qin’s own tomb in Shaanxi Province – the tomb most famous for its buried ranks of some 8,000 life-size terracotta warrior sculptures. The alleged “Greekness” of the Terracotta Army went viral, but archaeologists in China (and around the world) were skeptical and dismissive. Two weeks after the story broke, Zhang Weixing, head of the Emperor Qin Shi Huang’s Mausoleum Site Museum, told the AFP that there is “no substantial evidence at all” for contact between ancient Greeks and those responsible for the Qin tombs. Why were Xiuzhen’s comments so controversial? Entasis actually appears in early architecture around the world. Even so, in the early 19th century, some Europeans took its presence in early Japanese temples as “proof” of the Greek influence on Japanese architecture. Other celebrated Asian artworks have also been attributed to the Greeks. 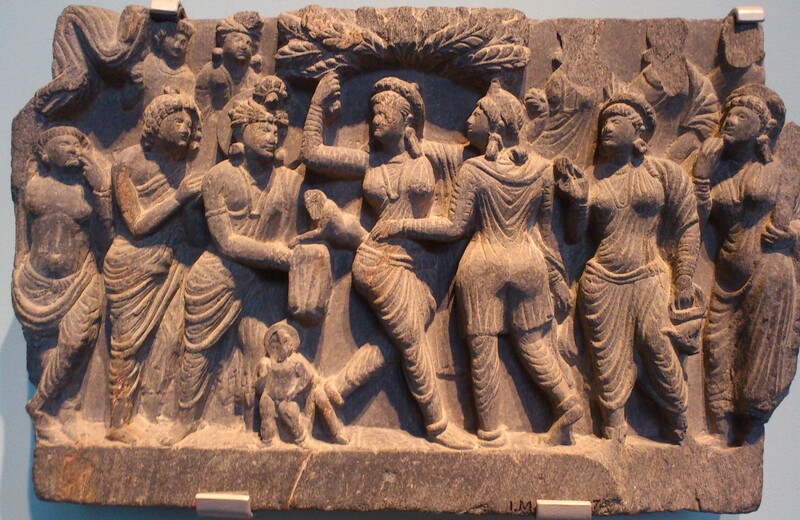 The notion of “Greco-Buddhist art” was invented to explain the pleasing proportions and elegant poses of sculptures from ancient Gandhara (in modern-day Pakistan). The only way to explain their sophistication, Europeans believed, was the influence of Alexander the Great and his retinue of talented Greek artisans who had traveled to Gandhara in the latter part of the fourth century B.C. Art historian Michael Falser has recently shown how the concept of Greco-Buddhist art, or Buddhist art with a Greek “essence,” is really a colonial notion that originated during British rule in India. In the West, examples of this art (represented largely by sculptures of Buddha), have since been largely interpreted as the result of Greek influence – and thus, implicitly, as an early example of successful European attempts to civilize the East. Likewise, travelers and archaeologists often fell back on theories of direct outside influence. How else could they explain sophisticated artistic techniques and engineering genius among “primitive” societies? In 1871 the German explorer Karl Mauch, on a quest to find the biblical region of Ophir, came across the ruins of the capital of the Kingdom of Zimbabwe, which had flourished from roughly the 11th to 15th centuries. Certain that no African people could have ever constructed such marvelous structures, Mauch vigorously publicized Great Zimbabwe as a city built by the biblical Queen of Sheba. This, he pronounced, was her Ophir, the source of the gold she sent to King Solomon (the Bible’s proverbial “gold of Ophir”) to use in the first Temple in Jerusalem. Whenever we say the cultural achievements of other societies are due to geographically remote – but familiar – genius and inspiration, there’s a cost. Surely Greeks could not have built such a marvelous city, Çelebi said. In his “Book of Travels,” Çelebi followed the precedent set by “all the Christian and Coptic chroniclers”: he attributed the founding of Athens to the prophet Solomon and, like Mauch in Zimbabwe, to the Queen of Sheba.